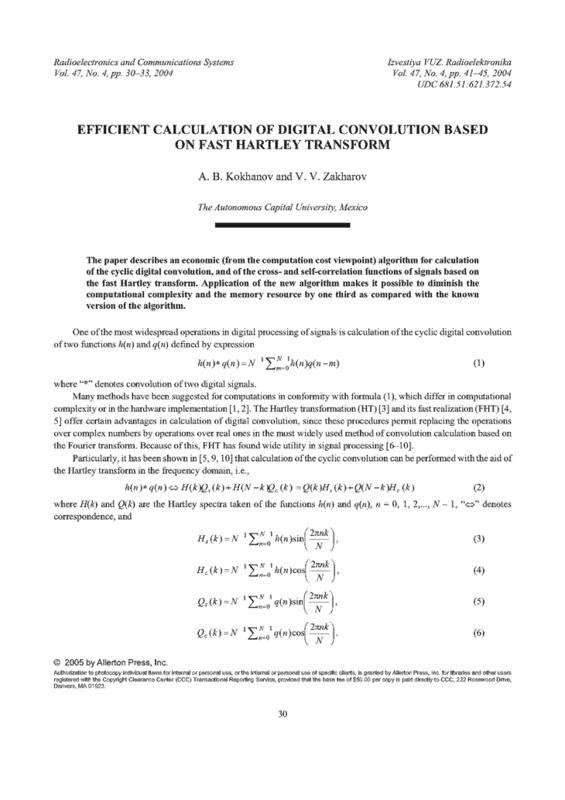 The paper describes an economic (from the computation cost viewpoint) algorithm for calculation of the cyclic digital convolution, and of the cross- and self-correlation functions of signals based on the fast Hartley transform. Application of the new algorithm makes it possible to diminish the computational complexity and the memory resource by one third as compared with the known version of the algorithm. OPPENHEIM, E. (ed. ), Applications of Digital Signal Processing. N.J.: Prentice-Hall, 1978. MACCLELLAN, J.H. ; RADER, C.M. Number Theory in Digital Signal Processing. N.J.: Prentice-Hall, 1979. HARTLEY, R.V.L. "A more symmetrical Fourier analysis applied to transmission problems," Proc. IRE, Vol. 30, No. 3, P. 144-150, 1942. DOI: https://doi.org/10.1109/JRPROC.1942.234333. VLASENKO, V.A. ; LAPPA, Y.M. ; YAROSLAVSKII, L.P. Methods of Synthesis of Fast Algorithms and of Spectral Analysis of Signals [in Russian]. Moscow: Nauka, 1990. AYKANAT, C.; DERVIS, A. "Efficient fast Hartley transform algorithms for hypercube-connected multicomputers," IEEE Trans. Parall. Distr. Syst., v.6, n.6, p.561-577, 1995. DOI: https://doi.org/10.1109/71.388039. SERGEYEV, V.V. ; USACHOV, V.P. "Preobrazovanie Hartli v zadachakh tcifrovoi obrabotki dvumernykh signalov," Komp’yuternaya Optika, n.10-11, p.168-177, 1992. SHIKHOV, M.S. "The discrete Hartley transform for experiment automation systems," Preprint of AS BSSR, No. 22, 1982.